What is a mist net? A Wilson’s Snipe with the Teton Range in the background. Snipe use those long bills to probe in the mud for food, like insects and other invertebrates (little squirmy things without backbones). Sometimes when I tell people that I band (and therefore catch) birds, they get real quiet and look at me strangely. Do you use a fishing pole, a butterfly net? Cages? Hold out birdseed in your hand and wait for them to land, then use super-fast reflexes to grab them? I’m working on that last one, but no. We use these nifty thingies (a scientific term, by the way) called mist nets. I handled my first mist net back in 2005 when I was a freshman in college (oh so long ago), so I’ve sorta forgotten that most people aren’t familiar with what one is. That’s the problem when you spend too much time hanging out with bird biologist types, you can use words like “mist net” and “trammel” and everyone knows what you’re talking about, and when you get jump-up-and-down excited about a Wilson’s Snipe or a Song Sparrow they’re right there jumping with you. Some people get into sports teams, I get excited about their bird namesakes. To each his own. Do not attempt this at home unless you are a trained professional. And I mean it. You have to be registered with the government (USGS) to catch and band birds, which requires a license, research permit, and proper bird-handling training. The Migratory Bird Treaty Act makes it illegal to “take, possess, import, export, transport, sell, purchase, barter, or offer for sale, purchase, or barter, any migratory bird, or the parts, nests, or eggs of such a bird except under the terms of a valid permit issued pursuant to Federal regulations.” The term migratory bird here includes just about every native species, so basically: if you see a bird in the wild, leave it alone. To see a complete list of the species covered and for more information, click HERE. 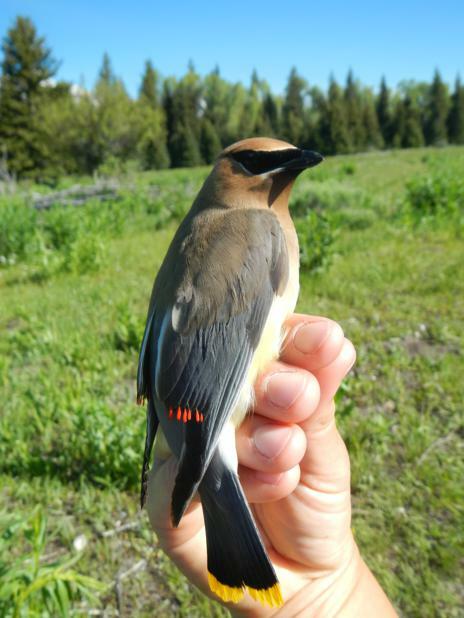 A Cedar Waxwing. Note the red waxy tips on his wing feathers. No one knows exactly why some waxwings secrete these tips, but they sure do look cool (and maybe help attract the ladies). We are trying to gather important information about bird populations, but first and foremost is bird safety. So if you ever come across a mist net with a bird in it, leave it alone. Don’t touch it. Someone will be coming along soon to safely get the bird out, I promise. Well-meaning passersby can seriously injure birds by touching them and trying to “help.” Would you go into a hospital, walk into surgery and start poking around in a patient? No, of course not. You need training to perform surgery– which is my point exactly. If you’d like to read a 66 page document put out by the Ornithological Council entitled Guidelines To The Use of Wild Birds in Research, click HERE. The last page also details the American Birding Association’s Code of Ethics, which are a must-know for all birders and anyone interested in observing birds in the wild. 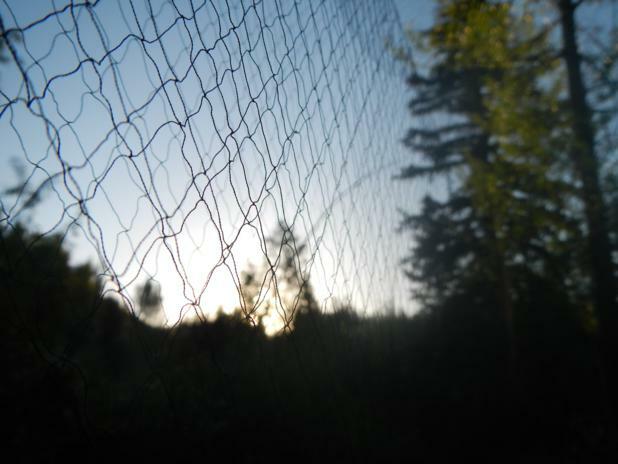 A mist net is a very fine net that we set up to catch birds. It looks like mist, and is a net, so we call them mist nets. Except they don’t actually look like mist. Imagine four 39.37 foot long hair nets (or 12 meters, since scientists reasonably use the metric system, unlike the rest of the US) strung between two poles, the bottom of the top one touching the next, and you have a fairly good idea of what a mist net looks like. Our nets are about 7-8 feet high, depending on how much we stretch them out, a guestimation based on the fact that we use 10 foot poles to string them on. Picture borrowed from my co-bander Bo. 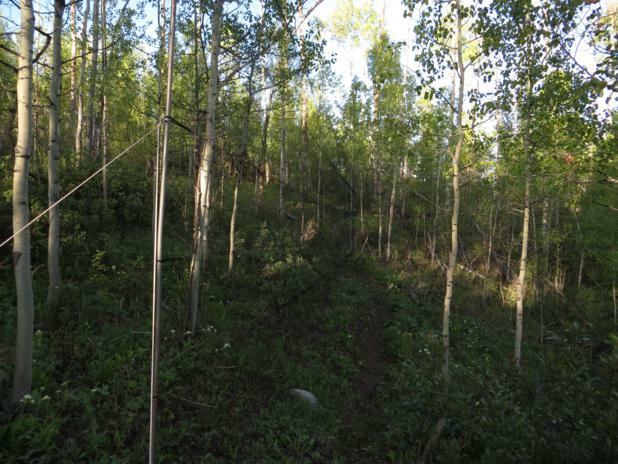 Can you see the net stretching from the pole (going right)? It’s rather difficult to get a good picture of a mist net, since they are so fine and hard to see. There are five thicker strings, called trammels, that have loops on either end and are what attach the net to the poles. Between the trammels stretch the mesh netting, which is fine enough that, once the net is spread open, is almost invisible (I’m guessing this is where the “mist” part of the name comes from). The netting forms a little bit of a pouch between each trammel, and when birds fly in they sometimes hit the net and fall into this pouch. We use smaller-meshed netting (there are different sizes depending on what type of birds you are targeting; we’re trying to catch everything that will fly into the nets), and so larger birds usually don’t become too tangled in the mesh but instead are trapped in the pouch. Sometimes they can get themselves out before we get to them by flapping their way down the net until they get to the edge by the pole and then escaping. The nets have give to them, so when birds fly into them they can bounce a bit, somewhat like the safety net below acrobats at the circus. I’ve watched birds fly directly into the net and bounce out, not getting caught at all. Close-up of a mist net. Note the small mesh size. I frequently get my fingers tangled while trying to extract birds, one of the hazards of having big hands. Smaller birds, like House Wrens and Black-Capped Chickadees, can almost fit completely through the mesh, and can become more tangled in the netting that larger birds (American Robins being an exception, the turds. And I mean that in a completely scientific way– their scientific name is Turdis migratorius, so we call them turd birds– from Turdis, of course, has nothing to do with the fact that they also they also tend to poop all over the place. The middle schoolers love it when I tell them that). When we check the nets, we have to very delicately untangle the birds from the netting, which, depending on the species and the individual bird, can take anywhere from a few seconds to a few minutes. In my experience, warblers typically are easier, because they hit the net and don’t struggle too much and so aren’t too tangled. Wrens, on the other hand, like to thrash around, trying to extract themselves, and can sometimes spin themselves around in the net, so that they look like little balls of black netting with a head and feet poking out. Usually we are able to quickly untangle the birds without hurting them or the net, but sometimes they become so tangled that the only way to extricate them safely is to cut the net. We carry small scissors and toothpicks, or sometimes crochet hooks, to use to slip the net off birds sometimes when our giant human fingers are too big to manipulate the thin netting off a tiny warbler or kinglet wing. 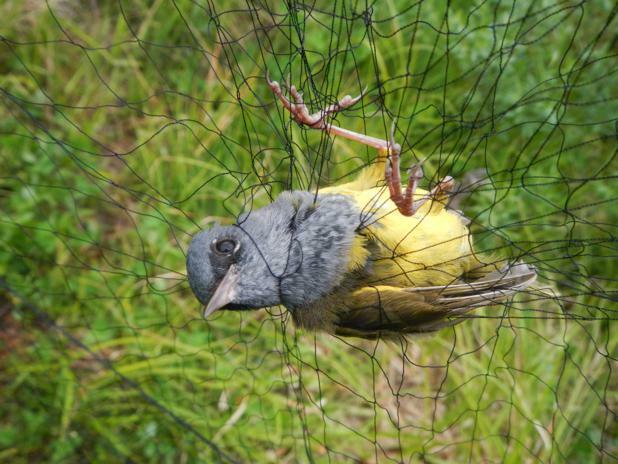 A MacGillivray’s Warbler in the net. It took me less than a minute to safely extract (untangle) him. 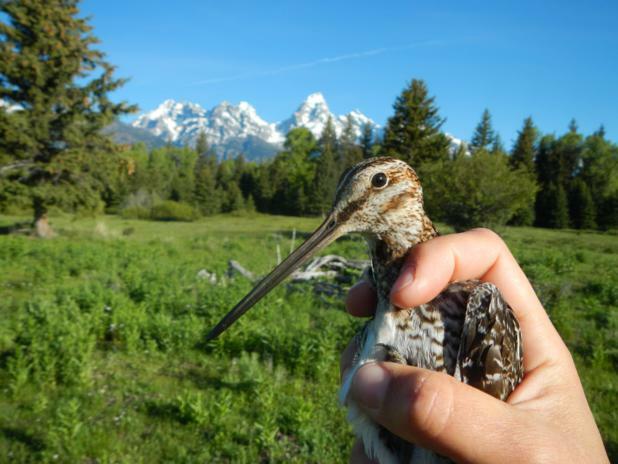 If you’re in the Grand Teton/Jackson WY area and would like to come out and see what we do at the banding station, join us for a Feathered Friday. There is a fee, but you get breakfast in addition to a visit with some fantastically amazing, beautiful, smart, witty, very-happy-to-be-up-at-4am- bird banders. Keegan, our crew leader, will also be there. He is just as cool as the rest of us, though maybe not quite as fantastically beautiful. (The rest of us on the crew are women, so poor Keegan has to put up with a lot sometimes). Hope to see you around the banding station sometime, but if not some of my coming blog posts will definitely include our banding happenings, so stay tuned! If you’re looking for a new blog to read, check out this one by Bo D’Amato. She’s my bunkhouse mate/roommate/fellow bander, and has a cool blog called The Eco Explorer. Check it out– there’s at least one picture of my hands holding a Wilson’s Snipe on there. Hello to my child! What a great explanation for those of us who are somewhat ornithologically challenged! Made me go ahead and sign up for the Feathered Friday event.